Why Ignore Everybody and Follow Your Dreams? No one can know you better than you yourself. So, if you dreamt of being something only you will be able to move on that path. You will be able to explain your goals and no one else will be able to understand it except your parents. So, it is better to do what you have seen your future to be. Follow the dream and tell the world that your dreams were never empty vessel. If you want to feel good about something, then it is better to do what you have dreamt of doing for yourself. If you will follow what others say, you will not be able to feel satisfied and good. You will feel irritated and the work will become a burden for you and when the work becomes a burden, it never makes you feel happy, thus you feel unaccomplished. Maybe first you follow what others say, but later you regret and ask yourself a question, that why did you not do what you actually wanted. If you want no regret in life, then you should walk behind your dream. When you will follow your dream, you will make mistakes and from mistakes, only you will learn new things. The naysayers are meant to demotivate but it’s you who have to make them believe in what you have intense trust and faith. If you will move behind the other’s dream, you will feel unaccomplished in life and also you will stop dreaming. No dreams mean no goals and no goals means no work and zero work makes a person dull and monotonous. The work you wish to do will make you less tensed and you will feel more on a cloud nine, else you will observe burden even in writing a line or a paragraph. The work should be done with fun, only then it will be a success. For example, you like photography, but if you are given a content to write, then you obviously will not find it interesting or end up writing anything irrelevant. So, it is better to do what you wanted to do. An astronaut will fail to understand the profession of a photographer or be a doctor or any other profession. This is because it is not his or her forte. An astronaut will know the hard work to be done or what are the qualification requirements in his field, so as you will know what your profession demand. This way only you will be familiar with the dream you had and no one will able to take your place when it comes to understanding the profession. By doing what others do not do, you will be able to bring a revolution in the society. When there will be a positive change in the society you live in, then you will feel powerful and an initiator. People who follow their dreams are called doers and doers have more power in influencing the world and its environment. Although memories will be there when you will adhere to what others say, but bad memories. If you want to accumulate good memories, go for what you wanted to become in future. There will be memories of both rise and fall, hard work done, mistakes you did and many more to cherish and make a day gleeful. The twist and turns in life will be welcomed happily if the task is of your interest. The new twist and turns will provide you challenges and those challenges will help grow. Novelty in opportunities put forth the chance to prove your might. So, it is always beneficial to witness the unexpected twist and turns in life, especially when it comes to walking your dreams. What is the need to follow, what everybody else is doing? No need. There are no rules in life. To make your life worth living, you should make your own rules and adhere to them strictly. Do not go for what others are doing. If you want to do something different, then why do something common. Need not do. Just work on your own principles and you will see a change in yourself. Once you accomplish your initial dream, you are filled with other successive big dreams. One dream gives birth to a number of others, this way a cycle of dreams comes together to get accomplished. When you are already done with your first dream, then it makes a sense of surety that it is never wrong to follow your dream by ignoring others. Everyone wishes to stand away from the line. The biggies from different fields became the one only by being on their own and also doing something different. If your dream is to be among them, then it is good to do what others do not do. The more the risk you will take, more will be the chances and opportunities to grow and enhance your expertise in a required field. It is not just that you have to do something different from others, but you need to do the same thing, in a different manner; this way you will be able to stand in line and look different from others. Your dreams are in your possession so you need to take care of your dreams like a baby, else there is no scarcity of critics in the world who will stop you from achieving a particular path of success. When you pursue your dream and stand for yourself and also do best in that, parents and the society certainly come around you and help you after seeing you, doing the best in the desired field. Also, when a person follows his own instinct, he ought to give 100% in the task and it eventually goes successful at the end of the day. You know better about yourself and also the same goes for your dream. If its you who dared to take a dream, then it can only be you who will understand it well. So this clear understanding about the plan and the goals is the best thing. 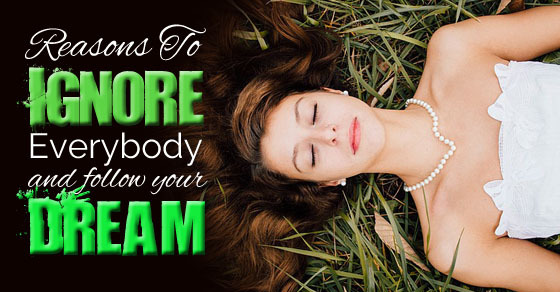 If you have a dream to follow as per your own wish, then you will certainly have a clear mind plan to attain that too. Others will fail to understand that plan and degrade you for your dream. Even if you have a dream to become a rockstar, people may criticize you for the same as in the eyes of society such fields are not respectable, but it’s you who know what kind of hard work is required and it’s your own duty to make others understand that no dream is big or small, it is just the perception of the mind . People are able to inspire others only when they have achieved something to show the world, but if there is nothing you have attained then how will you inspire anyone. So, if you will follow your dream, you will set an example and will be able to inspire others to do the same. Not just this, you will be able to help and guide others too. You will set an example and obviously you might also have gone through a number of rise and falls, so what you did during your difficult times, can be an inspiration to those who also wishes to follow your path. This way you will become a guide to others and it will be very helpful to you as well as others. When something does not interest you, you ought to feel tired, weary and uninterested but when you do something of your interest, then you never feel exhausted even if you will have to do the same thing million of times. It makes you enthusiastic and playful. This attitude towards work is always welcomed and appreciated by all. When you have some sort of pressure to prove your might, then you tend to give your best. When you give your best, you get the potential to challenge the status quo also, which in itself is a great achievement. This is because the status quo is for the whole society and the society is a big place to challenge. Challenging the society is a task, so to challenge it, you will have to follow your heart and mind and not the society. Having an idol in life is entirely different from becoming an idol to someone. Achieving success after too many hurdles in life can be stressful though, you come out warrior which makes you a different yet happy person. The journey of fulfilling one’s dream may be tough, but it’s never unattainable. All you need to do is dedicate hard work. Only the hard work will speak the language of your dream, thus making you an idol may be to those who once opposed your dream. When you decide to follow the difficult path, then you face challenges which help you learning number of lessons which otherwise you might not learn being in a comfort zone. So, this is also one of the major reasons to follow your dream and not what others are saying to follow. So, above are some of the reasons to follow your dream and ignore everyone who ignore your dream. Ignoring someone does not necessarily mean to hurt someone’s sentiments, but it does mean to shut their mouth, not through harsh words but through the work you do. It is rightly said that action speaks louder than words; so you need to follow this proverb and prove your and the potential of your dream.